In1975 the members of Pink Floyd found themselves in Abbey Road Studios trying to put together an album to follow up the enormous success of their previous album, Dark Side of the Moon. Though they were at a loss, they somehow found it in themselves to create an album, which is arguably in that same elevated class both musically and conceptually as their prior album. Thirty-six years later the epic five tracks, which comprise 45 minutes of music on Wish You Were Here, have been rereleased and re-mastered for the digital age allowing for the terrific production and precision of the original recording to be enjoyed by a new generation. It turns out that it was a handful of notes that singer/guitarist David Gilmour played accidentally, which brought back the memory of Floyd’s former frontman, Syd Barrett, who had fallen apart mentally due to drug use and left the band. This inspired Roger Waters to create the conceptual opus entwining the band’s feeling about their former bandmate with their distaste for the music industry in the songs. 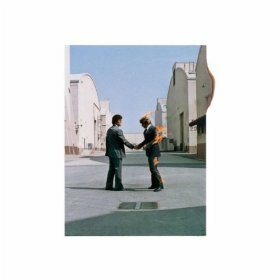 It’s rare to find an album in which all the songs are winners, but Pink Floyd manages to do just that with “Shine On You Crazy Diamond (Part 1 – 5),” “Have a Cigar,” “Wish You Were Here,” and “Welcome To The Machine.” The songs encompass everything that is wonderful about the band from the conceptual storyline to the music itself that has especially expressive guitar playing from Gilmour and Richard Wright’s fantastic keys and synthesizer elements to genius lyrics courtesy of Waters.